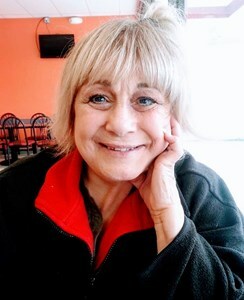 Diana L. Rella, 66, of Topeka, passed away peacefully on Sunday, February 3, 2019 surrounded by her family. She was born March 9, 1952 in Brooklyn, New York, the daughter of Jesse and Rosemary (Callelo) Pirozzi. Diana attended Plainage High School in Massapequa, New York. She was a member of Christ The King Catholic Church. Diana married her childhood friend Michael Rella in 1969 that she met at eight years old. They later divorced, he survives. Other survivors include their four beautiful children; Gina (Louis) Rella-Cordero of Dallas, Texas, Deana (Joseph) Rella-Cordero of Topeka, Michael Rella of Topeka, Danato Rella of Topeka, thirteen grandchildren, one great-granddaughter-furbaby; Sephora and her siblings; Katherine Mills of Queens, New York, Michael Pirozzi of Florida, Mary Hitt of California and Tina Marie Pirozzi of Florida. Diana was preceded in death by two twin daughters; Teresa and Rose and two sisters, Rosebud and Jessica. Two of Diana’s favorite quotes were; “She’s a pissa” and “I’m goin to Florida”. Diana will lie in state and the family will receive friends from 2:00 - 4:00 p.m. Sunday, February 10, 2019 at Dove Southeast Chapel, 2843 SE Minnesota Ave. Cremation will follow and private inurnment will take place at a later date. In lieu of flowers, memorial contributions may be given to the ALS Association Mid America Chapter, 6950 Squibb Rd., Mission, Kansas 66202. To leave the family a special message, please select the Share Memories option listed above. Add your memories to the guest book of Diana Rella. Man oh man this was a huge shocker for such an hard fighter! i miss you all so much. and all my blessing and all that your way! all of you guys keep your head up! I love you all and ill never forget the memories i had with your mommacita i hope the best for the next generation for all you guys. I met Diana around 1987 in Ives Etstates in Florida. From the moment I met her, there was never a dull moment. She was feisty, loud, crazy, intimidating at times, loving, caring, a woman you didn’t want to cross or you would feel her wrath. All of these things and so much more. Almost from the moment I met her, she took me in as one of her own daughters. I could recount thousands of memories together but they are ones that I share with her and Deana, Gina, Michael and Danny. There were many good times and some not so good but she was a woman that I held very dear to my heart and one that I will never forget. May you Rest In Peace. Love you....Paula. I am very lucky to have been in the company of Diana. She was the most colorful speaking people I have ever met. Her strength and courage I have seen in her daughter Deana, I have seen love and compassion in her son Micheal, and in Danny her nurturing spirit. You all have her in your heart and please know she will be with you every day until you all are with her again. Deana thank you for allowing me to be a part of her life over the last 6months. I truly am a better person because of your mom. Diana used to sit in the front seat of my van with the window down and a blanket on her lap all the way to Kansas City for Dr appts. I learned just about EVERYTHING there is to know about her kids and their kids :>) She was so proud of each and every one of them and loved them all dearly. She was, for the most part, the life of the party. I will miss her smile, her laugh, and how particular she was about her hair and make-up. She will be missed by all those who knew and loved her. MAY SHE REST IN PEACE. The heart that my mother has for others is a rare gift to the many people who had the privilege to know her and be blessed by her. May you find peace and comfort in knowing that so many come together grieving your loss . Mom you will surely be missed. God bless you. Most people only have one mom, and that is why moms are so special. I admire the life that you lived and I can only hope that I have as strong of a finish to my life as you did. No one can replace you Ma. May God comfort our hearts during this time, for He knows much better than anyone else just what we need.